Second purely solo album by The Libertines' loose cannon finds him finally feeling mortal. THE PETE DOHERTY OF MID-’00s tabloid infamy, glassy-eyed and sweating, was not a likely candidate to be still making albums in 2016. Yet, here he serves up his eighth in the 14 years since The Libertines’ Up The Bracket – a solid work-rate, by any stretch. 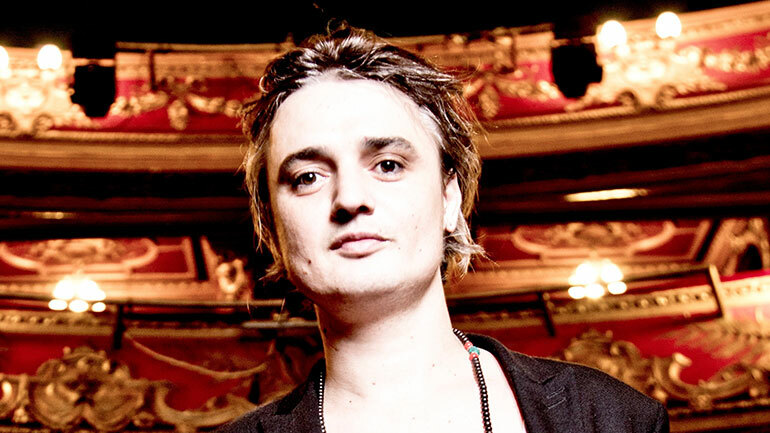 Where the Libs channel his punchier songcraft, and Babyshambles allows him to be more free-form, one might imagine his self-attributed records to be sketchy, indulgent, incoherent. Far from it: like 2009’s Grace/Wastelands, this second solo outing is all about tight tunes, minimally instrumented, with affectingly open-hearted lyrics – respite, perhaps, from the exhausting narrative of his frictional co-writing with Carl Barât. In early 2016, with Libs reunion operations intermittently ongoing, Doherty filled a scheduling gap by turning up at a day’s notice at Clouds Hill Recordings in Hamburg, and residing there for the ensuing six months. There, he wrote and recorded Hamburg Demonstrations, hiring the studio/label’s head-honcho producer, Johann Scheerer, and a pool of associated Deutsche musos, who provide a loose combo backdrop for their leader’s starry, Romantic flights of fancy. A recurrent theme is a fear of mortality: in opener Kolly Kibber, Doherty declares his unwillingness to expire like that character in Graham Greene’s Brighton Rock – a stealthy figure, whom newspaper readers are enlisted to track down in exchange for prize money (echoes of Pete’s time with Kate Moss, surely), but who gets “thrown from the ghost train, into the beautiful briny sea”. Exactly what Doherty’s saying is possibly encrypted in a second verse sung in indecipherable German, but the inexplicable magic this volatile character can weave becomes more than apparent at 2:15, as the lurching chorus gives way to a spine-tinglingly pretty breakdown, where female backing singers coo Kibber’s name, launching our hero towards his comically escapist resolve to “have a skinful, and sing Knees Up Mother Brodie!” And that’s just the first number. Further on, a warmer (and slightly retitled) take on his heart-wrenching lament for Amy Winehouse, Flags From The Old Regime, is equally packed with intrigue. As on last year’s funereally orchestrated single version, Doherty seems to unveil what he glimpsed within the toweringly beehived chanteuse’s soul, during a legendary hard drugs binge at her Camden crash-pad circa 2008 (just Google ‘doherty winehouse mice’). Chillingly, given her tragic passing in 2011, he croons about how “They made your fortune, but you broke inside”, and duly worries, “how’re you gonna stand up there in front of the whole wide world, when you don’t feel them songs no more?” Here, the pair’s bender extends to a sixth night, leaving a plausibly tired-and-emotional Doherty to mumble, “I don’t want to die in the shower.” Once heard, it’s hard not to think of Flags... when confronted with images of the lost-looking Amy in her final days. At the other extreme, Hell To Pay At The Gates Of Heaven rousingly meditates on the notion of fighting for your beliefs. “C’mon boys, you gotta choose your weapon/J-45 or AK-47?” runs the Clash-y refrain – guitar or gun? Band or army? Such was Doherty’s response to last November’s Bataclan terror attack, remarkably focused in its commitment to self-expression over violence, with a palpable undertow of apocalyptic fear. Also aboard are some lovely love songs: Libs-watchers will celebrate the official appearance of much-bootlegged She Is Far, the touching acoustic closer, which he penned in his teens, and is accordingly lit up by lurid images of moving to the capital. Again, though (and in keeping also with his contributions to 2015’s Libertines album, Anthems For Doomed Youth) it almost has the mood of a eulogy for a wayward sweetheart, whom he excuses “for every single dirty magazine”. Flourishing with fabulously heartbroken lines like “All those rivers underneath the city flow with tears”, Doherty is emerging as a master of weepie balladry, where even London’s sewers come up smelling of roses. Detractors might point to his reliance on pre-Libs compositions, and the two versions of I Don’t Love Anyone (But You’re Not Just Anyone) – one hauntingly orchestral, the other straight-up electric – as an indicator of creative bankruptcy. In truth, though, you come away from Hamburg Demonstrations only further assured of the breadth and indestructibility of Doherty’s talent.